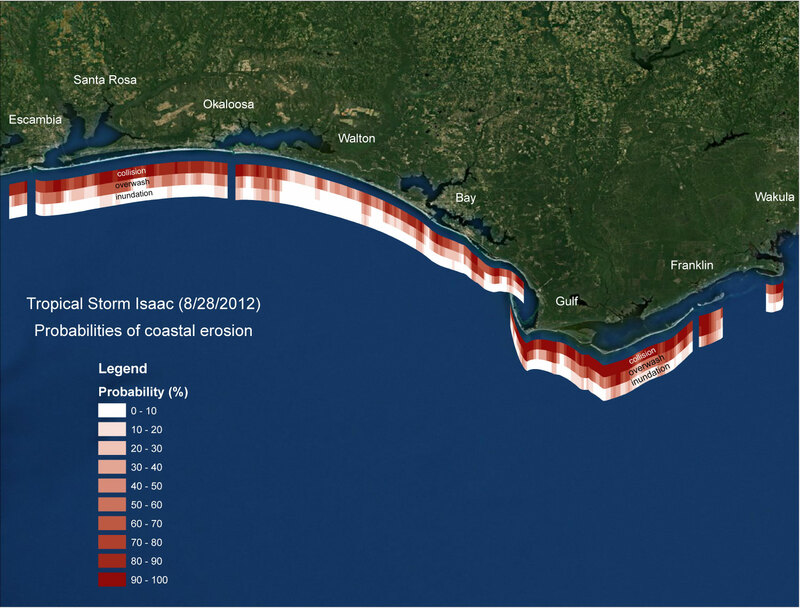 The probabilities of collision, overwash, and inundation associated with Hurricane Isaac were assessed for the sandy beaches in the northern Gulf of Mexico. Click on the images above to see the probabilities of collision, overwash, and inundation for the barrier islands of Louisiana, Mississippi, Alabama, and the Florida panhandle. 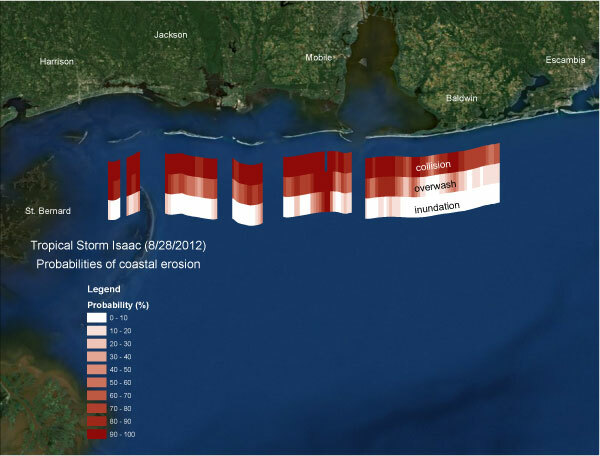 Coastal change probabilities give the likelihood that the beach system will experience erosion and deposition patterns consistent with collision, overwash, or inundation regimes. The probabilities were estimated by calculating the difference between modeled total water levels (including tide, storm surge and wave runup) and dune or berm elevations. The calculations assumed landfall at high tide, as represented by the 20-year mean high water level. 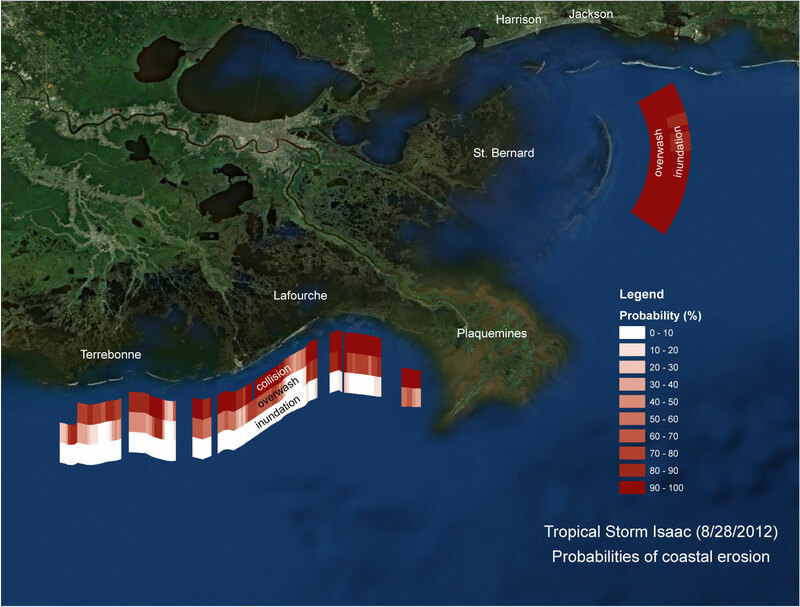 The storm surge elevations along the open coast were obtained from the National Oceanic and Atmospheric Administration's (NOAA) probabilistic surge forecast (psurge), which is based on conditions specific to the landfalling storm. Errors in hurricane forecasts are included in order to identify probable surge levels. The 50% exceedence surge level was used to represent the best-estimate scenario. Maximum wave heights obtained from the NOAA WaveWatch3 model 7-day forecast were used to compute runup elevations. Dune elevations were extracted from lidar surveys collected 2008.